In a worthy, synthesized portrait, a British food writer distills reams of published material on the much-studied Apis Mellifera and its productive kin. Though it took awhile for humans to get around to the beekeeping game, stone art reveals that they were avid honeyeaters from the start, writes first-time author Ellis. Touches of sly humor and pleasing renderings of her own days afield enliven her deft gathering of abundant facts. She explains bees’ social organization and foraging logistics, describes the trick of following a honeybird to a hive, examines the earliest evidence of beekeeping, and informs us that “a gallon of honey petrol could take a bee seven million miles.” Ellis doesn’t overdomesticate the miraculous. One of the strangest pieces of information she imparts is evidence that bees may have evolved before flowers. One of the most wonderful is how nectar is created and expressed through the honeybee’s art. Honey fuses the flavors of orange and coffee plants, or it reflects the thyme and marjoram hillsides of Greece, or it has a taste of Muscat grape, “a water-white honey said to be one of the clearest in the world.” The dark-brown rosemary honey, the salty honey that comes from the pohutukawa tree, the minty honey from the linden trees on Manhattan’s Lower East Side—Ellis pays tribute to them all. 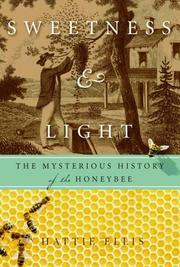 Equally enchanting is her history of honey-gathering, from its rude origins in the wild forest through woodland beekeeping and wicker hives (once Europe’s forest were no more) to the skep, that much-loved symbol of traditional beekeeping. Nor will the author deny the important role of the fermented drink mead in honey’s intoxicating magic. Those with a bent for natural history will find Ellis a class act, her style among the fanciful and insightful best.